The eel is a long, thin bony fish of the order Anguilliformes. Because fishermen never caught anything they recognized as young eels, the life cycle of the eel was a mystery for a very long period of scientific history. Although more than 6500 publications mention eels, much of their life history remains an enigma. The European eel (Anguilla anguilla) was historically the one most familiar to Western scientists, beginning with Aristotle, who wrote the earliest known inquiry into the natural history of eels. He speculated that they were born of "earth worms", which he believed were formed of mud, growing from the "guts of wet soil" rather than through sexual reproduction. Many centuries passed before scientists were able to demonstrate that such spontaneous generation does not occur in nature. Larval eels — transparent, leaflike two-inch (five-cm) creatures of the open ocean — were not generally recognized as such until 1893; instead, they were thought to be a separate species, Leptocephalus brevirostris (from the Greek leptocephalus meaning "thin- or flat-head"). In 1886, however, the French zoologist Yves Delage discovered the truth when he kept leptocephali alive in a laboratory tank in Roscoff until they matured into eels, and in 1896 Italian zoologist Giovanni Battista Grassi confirmed the finding when he observed the transformation of a Leptocephalus into a round glass eel in the Mediterranean Sea. (He also observed that salt water was necessary to support the maturation process.) Although the connection between larval eels and adult eels is now well understood, the name leptocephalus is still used for larval eel. One well-known location in which the large-scale collection of glass eels takes place (for deli food and stocking) is Epney, on the Severn, in England. (Glass eels are a food item in Spain.) Once they recruit to coastal areas, they migrate up rivers and streams, overcoming various natural challenges — sometimes by piling up their bodies by the tens of thousands to climb over obstacles — and they reach even the smallest of creeks. These freshwater eels spawn in the ocean, and then enter estuaries as glass eels and swim upstream to live in fresh water during their juvenile growth phase. As the glass eels enter fresh waters, they start to become pigmented and are typically referred to as elvers. The elvers grow larger and are referred to as yellow eels, which are the juvenile stage of eels before their reproductive maturation begins. How the adults make the 6,000 km (3,700 mi) open ocean journey back to their spawning grounds north of the Antilles, Haiti, and Puerto Rico remains unknown. By the time they leave the continent, their gut dissolves, making feeding impossible, so they have to rely on stored energy alone. The external features undergo other dramatic changes, as well: the eyes start to enlarge, the eye pigments change for optimal vision in dim blue clear ocean light, and the sides of their bodies turn silvery, to create a countershading pattern which makes them difficult to see by predators during their long, open-ocean migration. These migrating eels are typically called "silver eels" or "big eyes". The German fisheries biologist Friedrich Wilhelm Tesch, an eel expert and author of the book The Eel (ISBN 0-632-06389-0), conducted many expeditions with high-tech instrumentation to follow eel migration, first down the Baltic, then along the coasts of Norway and England, but finally the transmitter signals were lost at the continental shelf when the batteries ran out. According to Schmidt, a travel speed in the ocean of 15 km per day can be assumed, so a silver eel would need 140 to 150 days to reach the Sargasso Sea from around Scotland and in about 165 to 175 when leaving from the English Channel. Tesch — like Schmidt — kept trying to persuade sponsors to provide more funding for expeditions. His proposal was to release 50 silver eels from Danish waters, with transmitters that would detach from the eels each second day, float up toward the surface, and broadcast their position, depth, and temperature to satellite receivers. He also suggested that countries on the western side of the Atlantic could perform a similar release experiment at the same time. However, even today, only preliminary experiments along these lines have ever been performed. Migration was mapped in 2016. Knowledge of what happens to individual silver eels after they leave the continental shelf is based solely on the study of three eels found in the stomachs of deepsea fishes and whales — caught off the coasts of Ireland and the Azores — and on laboratory research into the physiology of eels. 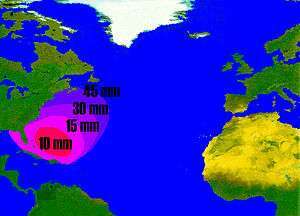 Another Atlantic eel species is known: the American eel, Anguilla rostrata. First it was believed European and American eels were the same species due to their similar appearance and behavior, but they differ in chromosome count and various molecular genetic markers, and in the number of vertebrae, A. anguilla counting 110 to 119 and A. rostrata 103 to 110. The spawning grounds for the two species are in an overlapping area of the southern Sargasso Sea, with A. rostrata apparently being more westward than A. anguilla, and with some spawning by the American eel possibly even occurring off the Yucatán Peninsula off the Gulf of Mexico, but this has not been confirmed. 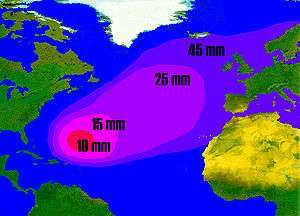 After spawning in the Sargasso Sea and moving to the west, the leptocephali of the American eel exit the Gulf Stream earlier than the European eel and begin migrating into the estuaries along the east coast of North America between February and late April at an age around one year and a length around 60 mm. Southern Africa's four species of freshwater eels (A. mossambica, A. bicolor bicolor, A. bengalensis labiata, and A. marmorata) have a very interesting migratory pattern. It takes them on a long journey from their spawning grounds in the Indian Ocean north of Madagascar to high up in some of the Southern African river systems and then back again to the ocean off Madagascar. In 1997, European demand for eels could not be met for the first time ever, and dealers from Asia bought all they could. The traditional European stocking programs could not compete any longer: each week, the price for a kilogram of glass eel went up another US$30. Even before the 1997 generation hit the coasts of Europe, dealers from China alone placed advance orders for more than 250,000 kg, some bidding more than $1,100 per kg. Asian elvers have sold in Hong Kong for as much as $5,000 to $6,000 a kilogram at times when $1,000 would buy the same amount of American glass eels at their catching sites. Such a kilogram, consisting of 5000 glass eels, may bring at least $60,000 and as much as $150,000 after they leave an Asian fish farm. In New Jersey, over 2000 licences for glass eel catch were issued and reports of 38 kg per night and fisherman have been made, although the average catch is closer to 1 kg. The demand for adult eels has continued to grow, as of 2003. Germany imported more than $50 million worth of eels in 2002. In Europe, 25 million kg are consumed each year, but in Japan alone, more than 100 million kg were consumed in 1996. As the European eels become less available, worldwide interest in American eels has increased dramatically. New high-tech eel aquaculture plants are appearing in Asia, with detrimental effects on the native Japanese eel, A. japonica. Traditional eel aquaculture operations rely on wild-caught elvers, but experimental hormone treatments in Japan have led to artificially spawned eels. Eggs from these treated eels have a diameter of about 1 mm, and each female can produce 2 to 10 million eggs. Strong concerns exist that the European eel population might be devastated by a new threat: Anguillicola crassus, a foreign parasitic nematode. This parasite from East Asia (the original host is A. japonica) appeared in European eel populations in the early 1980s. Since 1995, it also appeared in the United States (Texas and South Carolina), most likely due to uncontrolled aquaculture eel shipments. In Europe, eel populations are already from 30% to 100% infected with the nematode. Recently, this parasite was shown to inhibit the function of the swimbladder as a hydrostatic organ. As open ocean voyagers, eels need the carrying capacity of the swimbladder (which makes up 3–6% of the eel's body weight) to cross the ocean on stored energy alone. Because the eels are catadromous (living in fresh water but spawning in the sea), dams and other river obstructions can block their ability to reach inland feeding grounds. Since the 1970s, an increasing number of eel ladders have been constructed in North America and Europe to help the fish bypass obstructions. In New Jersey, an ongoing project monitors the glass eel migration with an online in situ microscope. As soon as more funding becomes available, it will be possible to log in to the system via a Longterm Ecological Observatory (LEO) site. ↑ Freud, Sigmund, "Beobachtungen über Gestaltung und feineren Bau der als Hoden beschriebenen Lappenorgane des Aals" ["Observations on the configuration and finer structure of the lobed organs in eels described as testes"], Sitzungsberichte der Kaiserlichen Akademie der Wissenschaften. Mathematisch-Naturwissenschaftliche Classe, Vol. 75, p. 419 (1877). Freud's study was in response to Szymon Syrski's book Ueber die Reproductions-Organe der Aale (1874); see Ursula Reidel-Schrewe "Freud's Début in the Sciences" in: Sander L. Gilman, Jutta Birmele, Jay Geller, Valerie D Greenberg (eds. ), Reading Freud's Reading, NYU Press, 1995, pp. 1–22. ↑ "Was dachten Nazis über den Aal? | Archiv - Berliner Zeitung" (in German). Berlinonline.de. 2004-10-20. Retrieved 2013-07-16. ↑ FH. "Der Aal im Nationalsozialismus". Wno.org. Archived from the original on December 17, 2011. Retrieved 2012-01-04. ↑ "Sigmund Freud und der Aal" (in German). Kulturkurier.de. Retrieved 2013-07-16. ↑ "Empirical observations of the spawning migration of European eels: The long and dangerous road to the Sargasso Sea". Retrieved 11 October 2016. ↑ "Demand for Baby Eels Brings High Prices and Limits". Web.archive.org. 2000-12-03. Archived from the original on December 24, 2002. Retrieved 2012-01-04.